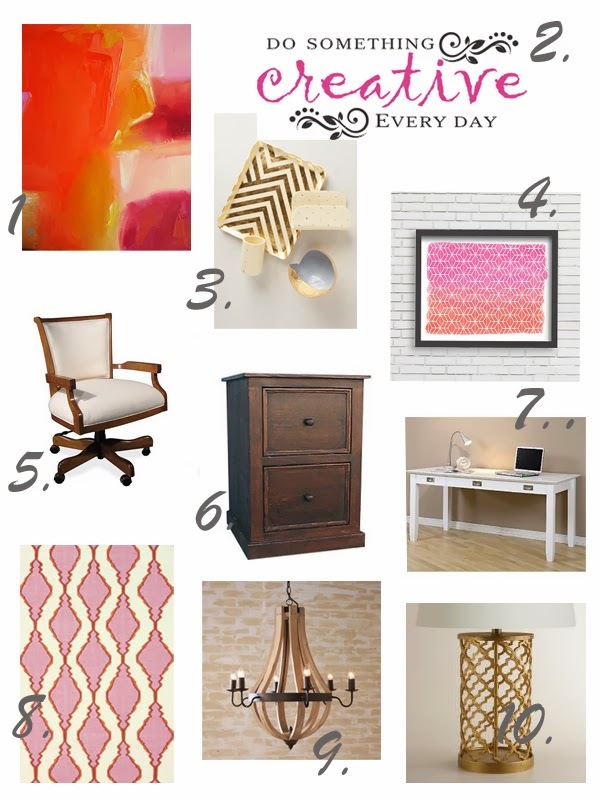 Today's mood board takes the home office to a whole new level. I'm talking fun with bursts of color, yet functional and simple without a lot to distract you when you are trying to be productive. Let's take a look at the pieces that make this home office the gorgeous space that it is. 1. This warm and bright abstract art piece was, along with the rug, one of the starting points for pulling this room together. 2. This Wall Quotes™ decal is the perfect reminder to take a break and "do something creative every day." 3. Cute AND functional? I'll take it! This set of desk accessories looks more like art than organizational tools. 4. This geometric watercolor print is bright, modern, and fits our color scheme perfectly. Sold! 5. Combining form and function, this office chair from Ballard Designs is also pretty to look at! It comes in lots of fabric options, too, to match any décor style. 6. With a sophisticated yet rustic feel, this filing cabinet is the perfect way to add some warmth to this space. 7. This sleek and contemporary desk is both stylish and affordable! 8. Who doesn't love the trellis trend? We certainly do, especially when it's combined with a great color palette like in this durable wool rug! 9. There's nothing like a great light fixture to make my heart go pitter-patter. This rustic yet modern chandelier is perfectly aged, and beautifully crafted. 10. This distressed gold lamp adds some glam and sophistication to this office space...what's not to love?